I am going to be reviewing on of the best bath blasters I have ever used. Father Blissmas is a 160g bath blaster from Bomb Cosmetics. Measuring 8cm x 7cm this is so much amazingness for an a great price! Note: If you haven't seen this blog post yet then please give it a quick read before reading this blog post review. Bomb Cosmetics was established over 14 years ago, is a closely guarded and cherished secret in the cosmetics business. All products are handmade using their carefully selected ingredients all in their own premises in the UK. They pride themselves on making their products to not only smell and feel wonderful on your skin but they must look beautiful too. Bomb Cosmetics are not tested on animals, free from parabens, and paraben based preservatives. I have been asked to note that this bath blaster may look like a yummy treat but please don’t attempt to eat it! Where you naughty or nice this Christmas time? 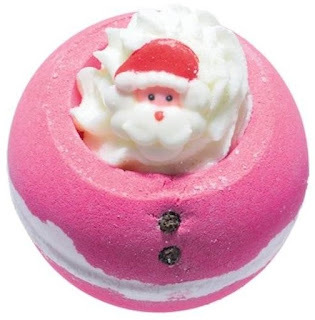 Better have been nice, because Father Blissmas is coming to town and you will want to enjoy his pure ginger and cinnamon bath blaster giving a Christmas delight, with infused with essential oils and added natural butter for a festive pamper treat. 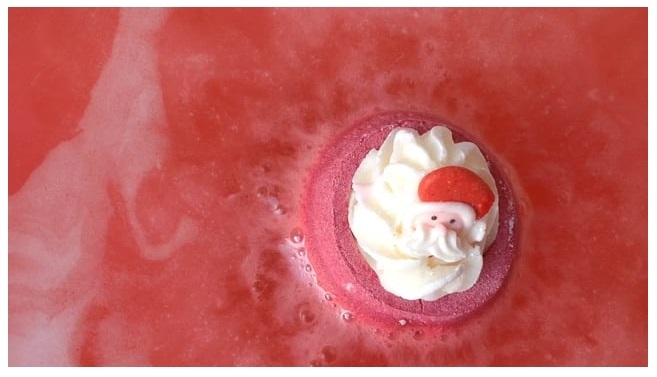 The raspberry pink blaster has a piped creamy topper, cleverly decorated with Santa’s face and red bobble hat. Iridescent sparkles evoke the magic of Christmas - even after Christmas. These handmade luxurious bath bombs ooze glorious scents and will make you feel fresh and relaxed. A must have for the ultimate bathing experience. It's such a delicious stocking filler for a friend or loved one! Drop your bath bomb in to a bath of warm slightly hot water and watch as it fizzes, releasing its perfume and essential oils, while the Bicarbonate of Soda softens the water. Vimeo has a Father Blissmas bath blash video, which you can view for free without signing up to the website. If you would like to see that video then please click here. I'd recommend this gorgeous Christmas tree to everyone; not only does it smell amazing, make your bath look amazing but it also makes you feel amazing! 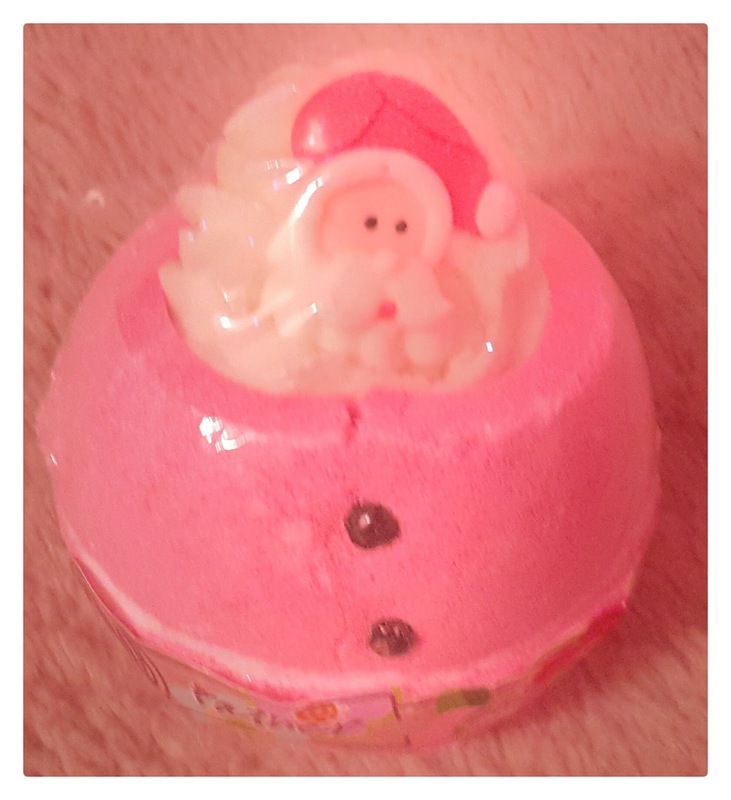 I'd not a fan of bath bombs or bath blasters that make my skin feel oily after I've used them, like a lot of the Lush bath bombs make me feel, but I am a huge fan of feeling silky and smooth after bath time and this is what this makes me feel. You can buy Bomb Cosmetics products from their website, or find your nearest store online by clicking here. If you'd like to request a review for me to do then please feel free to do so by contacting me by commenting below or by contacting me on one of my social media accounts linked below. I hope you all have a wonderful day! That looks so nice! I love the smell of raspberries. This is the cutest little thing I've ever seen! I must admit I am guilty of being blindsided by Lush and forgetting about all the other amazing bath companies there are out there! 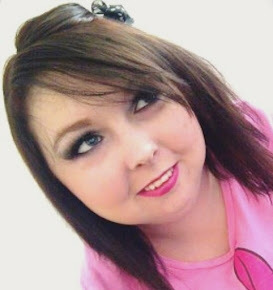 Will have to try Bomb Cosmetics soon! This is the cutest bomb ever - plus cinnamon is my weak spot!